Baptism He was baptized on 27 October 1811 at Independent in Hatfield Heath, Essex, EnglandBG. Marriage He and Jemima were married. Baptism He was baptized on 26 June 1814 at Independent in Hatfield Heath, Essex, EnglandBG. Baptism He was baptized on 23 February 1817 at Independent in Hatfield Heath, Essex, EnglandBG. Marriage He and Charlotte Sapsford were married on 24 December 1838 at ST GILES CHURCH in Great Hallingbury, Essex, EnglandBG. Birth Keren Huppach Thurley was born in 1820 in Little Hallingbury, Essex, EnglandBG. Baptism He was baptized on 28 June 1820 at Independent in Hatfield Heath, Essex, EnglandBG. Death He died in January 1841 at age ~21 in Little Hallingbury, Essex, EnglandBG. Birth Harriet Thurley was born about 1842 in Great Hallingbury, Essex, EnglandBG. Baptism She was baptized on 5 June 1842 at ST GILES CHURCH in Great Hallingbury, Essex, EnglandBG. Death She died about 1843 in Great Hallingbury, Essex, EnglandBG. Burial She was buried on 9 October 1843 (2) at ST GILES CHURCH in Great Hallingbury, Essex, EnglandBG. Baptism He was baptized on 7 June 1815 at St Giles in Great Hallingbury, Essex, EnglandBG. Baptism She was baptized on 4 June 1817 at St Giles in Great Hallingbury, Essex, EnglandBG. Burial She was buried on 22 June 1836 at ST GILES CHURCH in Great Hallingbury, Essex, EnglandBG. Baptism She was baptized on 15 January 1832 at St Giles in Great Hallingbury, Essex, EnglandBG. Burial She was buried on 1 April 1832 at ST GILES CHURCH in Great Hallingbury, Essex, EnglandBG. Birth Joseph Prior was born in 1789. Marriage He and Hannah Thurley were married on 11 December 1815 at ST GILES CHURCH in Great Hallingbury, Essex, EnglandBG. Burial He was buried on 14 July 1863 at ST GILES CHURCH in Great Hallingbury, Essex, EnglandBG. Marriage George Prior and Sarah Thurley were married on 24 December 1821 at ST GILES CHURCH in Great Hallingbury, Essex, EnglandBG. 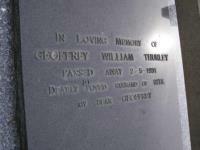 Marriage Henry Charles Thurley and Lucy Doe were married on 7 July 1924 at ST GILES CHURCH in Great Hallingbury, Essex, EnglandBG. Marriage Frederick Arthur Thurley and she were married on 6 September 1933 at ST GILES CHURCH in Great Hallingbury, Essex, EnglandBG. Marriage Patrick Murphy and Ethel Edith Thurley were married in 1938 in Woking, Essex, EnglandBG. Death She died in 1983 at age ~83. Death She died in 1984 at age ~83. 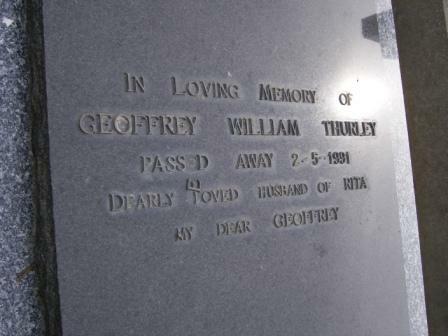 [GS] Gravestone of Geoffrey William Thurley in Tasmania, Australia. Death He died in 1994 at age ~85. [GS] Gravestone of Effie Calvert (nee Thurley). 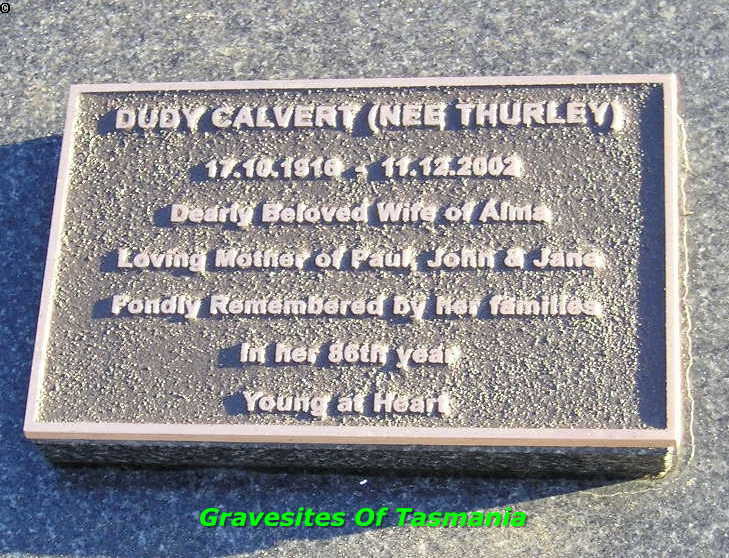 Birth Effie Adeline (Dudy) Thurley was born on 17 October 1916. 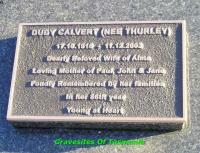 Name-Nick Effie Adeline (Dudy) Thurley also went by the name of Dudy.